At 4:30 am, the spooky, arid breeze was remarkably cool for summer in the Middle East. Rosy dust danced around the sand-colored van in eastern Aleppo. John Kahler and Zaher Sahloul, two American doctors, were shoehorned inside. They had come to this war-ravaged city to help treat its waves of wounded. Now, they were getting out. ​​​The van was bound for Castello Road. It was the only route in or out of the besieged Syrian city, and it was paved with peril. On one side, rocket-propelled grenades. On the other, sniper fire. And overhead, the roar of armed jets and military helicopters. The van's driver wore two pistols holstered over his shoulders. He muttered a few words in Arabic and pulled a string of prayer beads out of his pocket. Then he jammed his foot down on the gas pedal and the van shot forward. Along the road, the doctors saw buses and trucks flipped upside down and craters still smoking where missiles recently landed. Crates of fruits and vegetables were smashed and scattered across the dirt. And there were bodies — or in some cases, just body parts — in pools of dark blood. The air smelled of scorched metal and rotting flesh. This is what a failed humanitarian effort looks — and smells — like. ​"This is not things as usual," Sahloul told NBC News, saying that even for war-scarred Syria, the situation inside Aleppo is critical. "This is a looming humanitarian disaster of unprecedented proportions." Sahloul, a Chicago-based trauma surgeon and a member of the Syrian American Medical Society, speaks every day with people still inside the city. He and Kahler were among the last people to get out of Aleppo before Castello Road was cut off in July. At least 750 of doctors have been killed across Syria since the war began five years ago. 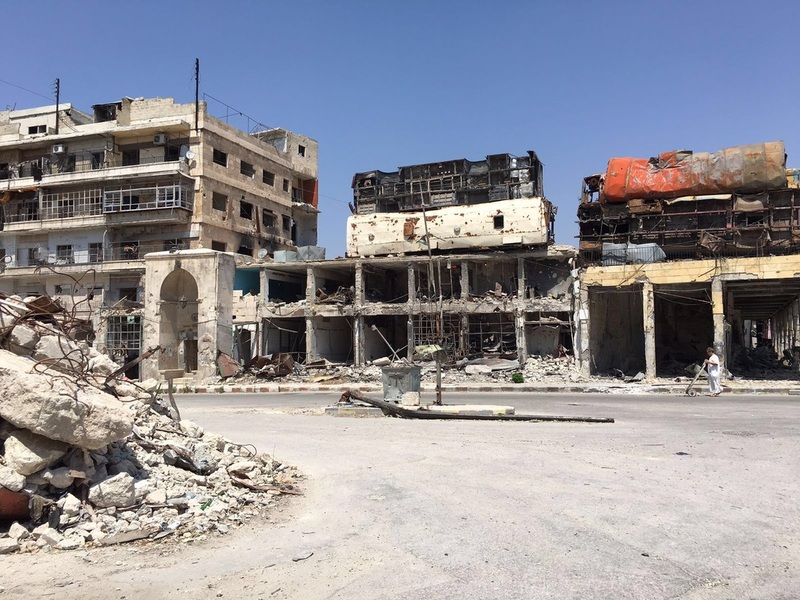 Now, only 35 physicians remain in Aleppo to care for hundreds of thousands of people. 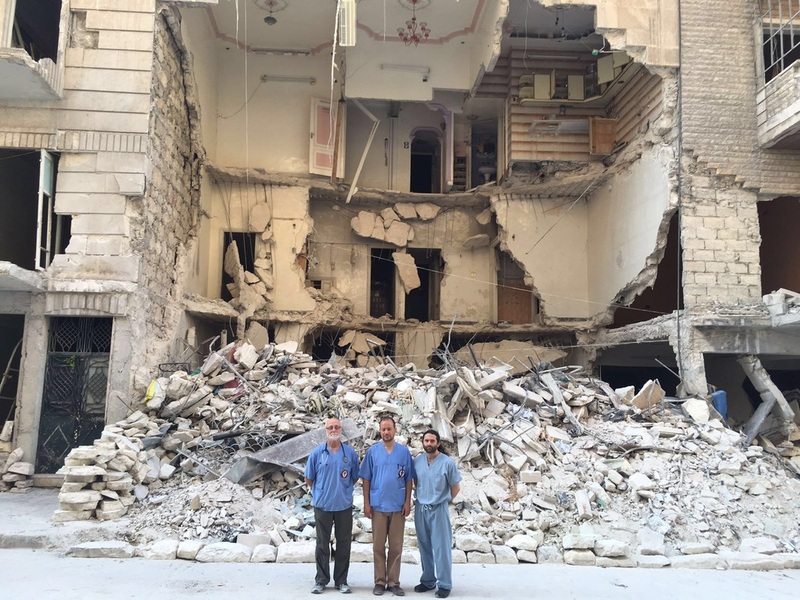 "You don't just kill one doctor, you kill all his future patients," said Kahler, who volunteered at Aleppo's M2 children's hospital at the end of June. The U.S. and Russia negotiated a truce that began this week, but conditions in Aleppo remain grim. Since July, no food or supplies have been able to get in or out of the city, and the ceasefire has yet to change that. Local residents estimate they have enough to sustain themselves for one more month. After that, hundreds of thousands of people will slowly starve to death. Fuel is scarce and that too can mean death. A pregnant woman bled out in her home after delivering a baby last week, because the family car's gas tank was empty so they could not drive to the hospital. ​The doctors who remain in Aleppo lack the medical supplies they need. The one CT scan broke last July, setting diagnostic abilities back to the 1960s. Surgeons are forced to operate in dark basements, sometimes guided only by the glow from cell-phone screens, flashlights and headlamps. With limited suture kits, doctors used household needle and thread to sew patients' bellies back together. They drill into broken bones using construction-grade equipment. Their scalpels are dull. No one receives anesthesia — they feel every tug and cut and crack. ​​In the emergency room at the M10 trauma center, two or three wounded patients share a single gurney. There are only 15 beds. When those fill up, wounded people are placed on the floor. Doctors assess 20 to 30 patients at once. They are vastly outnumbered. "You do your best," said Dr. Samer Attar, speaking from his office at Northwestern Medical Center in Chicago. He spent two weeks this summer in Aleppo, on call 24 hours a day, working alongside local physicians. "When you save a life, you do so at the expense of letting someone else die." Attar remembered hundreds of people flowing into the ER at once, everyone in urgent need of attention: Faces burned beyond recognition. Children with their intestines falling out of their guts. Adults missing all of their limbs. ​"Even the sickest horror movie director couldn't come up with the things you see in Syria," he said. Attar was the last American in Aleppo and narrowly survived the escape — something he attributes only to chance. To be a doctor there is to be a constant target. Since 2011, 269 separate medical facilities have been attacked 382 times across the country, according to Physicians for Human Rights, a U.S.-based NGO, whose data has been cited by the UN Security Council. According to PHR, 90 percent of the attacks were carried out by the Syrian government or their allies. It's unclear how many hospitals are still functional in Aleppo. Some say there are nine or 10, while others say it could be as low as five. They are repeatedly attacked, rebuilt or relocated, so the number is in flux. The people in the most critical condition are taken to M10. It is a three-story building but bombs hit so many times that no one dares ascend above the basement anymore. The entrance is a downward-sloping ramp. This path is frequently lined with bodies wrapped in white sheets — those who could not be saved. It is built like a makeshift fortress. Doctors drag sandbags and barrels around the outer walls, hoping to block shrapnel if and when another bomb drops nearby. ​"You'll hear them landing 100 meters from the hospital and it shakes. Your heart races. You feel like there's another bomb coming and you may end up on the floor injured next to the very people you're treating," Attar recalled about his time in M10 this summer. In Aleppo, the thunderclap of explosions have become normal. People say bombing sounds are as commonplace as chirping birds. The UN stopped counting the official death toll years ago. Most reports are based on second- or third-hand information because it is so difficult to get in or out of the city. ​Amid the destruction are pockets of life. Girls climbing over bombed-out ruins as a new-found shortcut home. Young boys kicking a soccer ball down an alleyway. A small market selling fruits or ice cream in the middle of the night. In a series of separate interviews, Aleppo citizens used terms "lovely" and "beloved" when referring to their home turned death trap. Dr. Rami Kalazi was the last neurosurgeon in Aleppo until this summer, when he decided it was too dangerous for his wife and young son. He paid a smuggler $700 and walked for 12 hours, running across the border into Turkey. Now he is one of 4.5 million Syrian refugees. 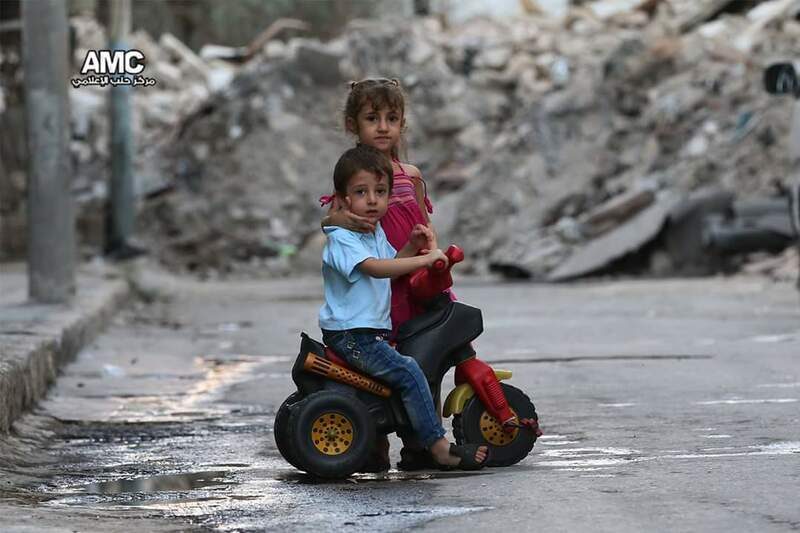 ​"I lived for 30 years in Aleppo. Now I am forced to leave my job which is saving lives," Kalazi said. "I cry everyday because I am too far from home." Kalazi's only child is not yet 2 years old, born in the middle of the conflict, but the doctor hopes he will learn about where he came from. "I will tell him stories," Kalazi said, "I will tell him how it was before the war and what it became."